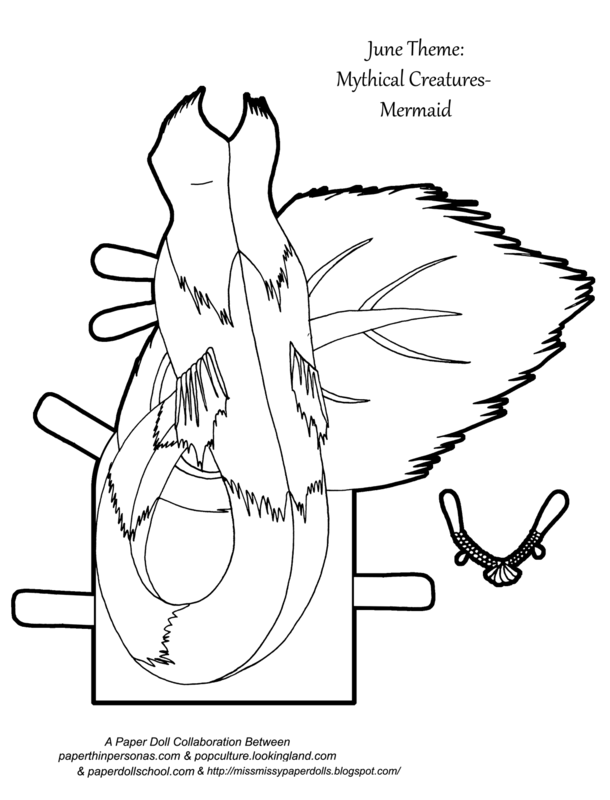 Today’s Printable Paper Doll Inspirations: Mermaids! Because I like ’em. So, this isn’t as inspired as Sekhmet by Boots or Julie Williams amazing centaur or Miss Missy’s Lamia/Naga, but this month has been crazy, so I went for a mermaid. The truth is that I was sick at the start of this week and then I had some blog related problems, but I have been assured those are fixed. However, if anyone has an issue, please email me at paperthinpersonas(at)gmail.com. It seems the blocking issue was only impacting people in specific geographic regions, so it was really hard to track down. Of course, when the blog is down, I tend to stress out about it and it makes it hard to want to create new content. Luckily, things should be back to normal next week. This collaborative paper doll project has been so much fun. When we came up with the idea, I confess that I wasn’t sure we’d be able to make it through the whole year, but here we are in June and we’re still going! Be sure to check out Popculture and Paper Dolls, Miss. Missy and Paper Doll School for three other literature inspired paper doll outfits. Need a doll to wear this stylish outfit? Grab the Doll here. I’m really glad someone did a mermaid, they are one of my favorite creatures! I’ve loved your past mermaids as well. Feel better! I love mermaids, and this one is gorgeous! Thank you! she’s an unconventional mermaid, so that makes her all the better! love the little necklace too. hope you’re feeling better; sounds like you’ve had more than your share of woes! This is really cool and definitely feels like an edgy mermaid. Happy to hear that things are going back to normal for you!